Over the past few decades, influence of technology upon children and education has been immense. Education was once equated with money, but things have changed. Great education for your children is no more a dream. It’s affordable. Even average families can afford a mobile phone in which applications can be downloaded. While there are a lot of applications available at the app store, choosing the right one for your child can change the way they look at the process of learning. Educational apps are making things easier for children to understand. Books are often found to be tiring and boring for children while replacing them with colourful pages and moving animations can make learning fun to the core. Experts say that apps in education can make children more interactive and activate better engagement between parents and children. The most effective way is to engage with the children while they are using applications. Interaction tendency in children is enhanced by mobile applications. Thoughts of traditional methods of learning accompany a generic feeling of boredom. They do not favor drifting from the monotonous learning patterns of restricted and upright book learning, thus dissipating the engagement factor. Technology in the guise of apps is helping those looking for some newness in the universe of learning. In addition to the feel of novelty, apps add an element of fun and involvement to the learning process. Through games, puzzles or other challenging tasks, app learning stimulates the brain cells to actively metabolize the input unleashing a new perspective. The ideal concept of frequent parent teacher interactions finds its space in the articles and books regarding performance enhancement but not in reality. Owing to the tight schedule of both the parties, it is just not possible to maintain the rapport through physical interactions. But now, we have apps. Teachers can attend to the queries of the parents anytime and anywhere through an ominous device called the phone. This fosters transparency regarding the child’s growth at school. The power of digital world lies in the ginormous amount of resources that fill its nooks and corners. The wealth of this platform implicates its popularity among knowledge seekers. The reach of this platform makes it a favorite to people who cannot afford the luxury of full time courses in schools or colleges. Mobile applications help them access a compendium of ebooks and pdfs and other online materials and the freedom to access it beyond the boundaries of time and space. According to studies, mobile apps promote entertainment. Learning is no more a passive activity, it’s active with applications. Lessons transforming to games can change the face of education. Children will enable a kind of interest in learning. Level based apps instil determination to pass each level. Apps without doubt enhance education. No more boring home works and tough class lectures. 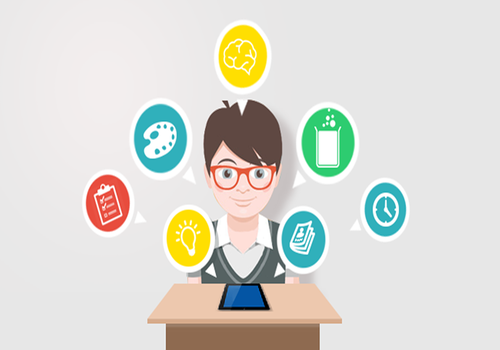 Unlike school, mobile applications are available round the clock. No need to be worried about schedules. Anywhere can be a classroom. App learning is not time-bound learning, its relaxed learning. Most of the apps promote child-friendly control. Children should only need to reach out for the device when they feel like learning. Little ones can operate it without much effort. No responsible parents want their kids to get addicted to the “idiot box”. Too much internet usage and talking over the phone for hours are not wise options for killing time. This is where mobile apps prove their worth. Mobile app learning is one among the wisest choices of utilizing your free time actively. If a child has lots of leisure time, it can be utilized to learn something new with the help of a learning app. Entertainment guaranteed without wasting time. It’s a relief to get all the mundane tasks done with a few taps. Be it tasks like fee payments, other transactions which require us to stand in a queue for hours or the laborious job of marking attendance that drives teachers crazy with the amount of paperwork smiling back at them each day. All this drudgery has been put to an end simply by having apps in place. The life of each individual associated with the ecosystem is now simple and functioning, more efficient. The wheel of time has spun to drive the progress to land us into the world we live in today. The advancement that schools have seen eliminated a lot many glitches that prevailed in the education system. A major one being the lack of interaction between the teachers and the teachers. Apps and websites have been created to help reduce the gap not just between the students and the educators but also among parents and the teachers. Students and parents can be kept in the loop of every event, schedule change or announcement. While millions of trees are cut down for making papers for the traditional method of learning, mobile apps in education requires just a download. It means a greener earth for future generations. Mobile learning process has sustainability. Completing a lesson with an app is much more effective as it is learning from experience rather than from compulsion. Smart learning is one thing and systematic learning is next. App based learning enables both. Mobile apps help in systematic learning. Apps are arranged in such a way that, it promotes not only a craving for learning but systematic learning. The apps are arranged in a systematic way that it becomes possible for students to go with the flow without even realising. There are no constraints for mobile phones.. They can be constant companions of parents and students. Thereby, apps are available to children anywhere, anytime. Learning will not be confined to the classrooms alone. It’s a misconception that only children are benefited out of the apps. Teachers and parents also benefit from using educational apps. Teachers can make use of apps in classrooms. There are apps that help teachers to plan teaching materials. App based learning allows teachers and parents more time to discuss lesson plan for better interactive classes. While selecting apps for children, parents and teachers can contribute a lot. Using mobile apps for learning is more sustainable compared to the traditional learning methods which include papers, pencils, and pens. Getting reference notes is very simple in mobile learning- just download it. This results in a lesser number of trees being cut down every year. There are some apps which are not only meant for learning but also to stay updated about campus events, timetables, alerts and other important information. Soon apps will allow you to do the educational related payments such as tuition fees, library fines, etc. They also provide opportunities to interact with students throughout the life cycle of prospects, enrolled students, and alumni. With some apps, you can track your children’s progress which is one of the important things that every parent wants to know. Along with the progress, you can visualize how each app is helping your children to improve their skills such as reading, maths and much more. Educational apps are the best way for children to stay connected with their teachers. Though the way of learning through apps is entirely different from the traditional learning method, it adds value to the entire process. 72 of the top 100 universities in the United States use Google apps.